Our extensive experience with custom homes and remodels brings a richly different perspective to the multi-family projects we design that are usually targeted at renters with lower incomes. These projects must be ruthlessly efficient, but the essential attributes of home are still important. We especially love finding ways to make spaces do double duty, to bring in as much natural light as possible, and to make small spaces feel generous. We want your building venture to be successful and for people to love living there. 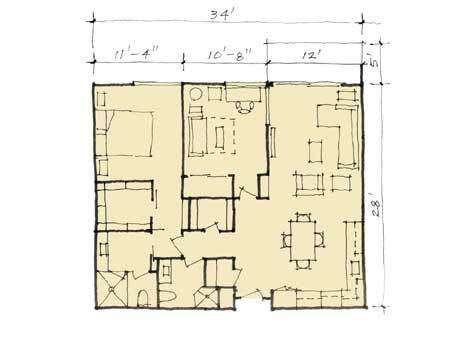 Sometimes the first step is prior to acquisition of the property where we do a test fit site plan that includes unit counts, parking counts and floor areas to create a preliminary pro forma. At this diagrammatic stage, we are still thinking about how to create a sense of community as well as to provide for privacy, daylight, views, and the other amenities that will make this a special place to live. We will do a comprehensive search of the zoning, code and other constraints that will affect what can be built. Of course, we are also thinking about how to maximize the efficiency of construction and the best utilization of the property. Prior to beginning actual design, we aim to understand what you want to accomplish in general and specific ways. Whether you have specific ideas or more general goals that need fleshing out, we can work with you clarify the program. Once the scope of the project is clear, we put together a detailed proposal for our services including the time and cost. When we proceed to laying out unit plans, we always work in 3D at the same time. We always draw the furniture to accurately study the function of a space and we always look for what will make the project the most valuable in the end. On some projects these models are more detailed, and we use them to study alternatives of materials and colors and construction details. We can send you the model to explore on your own or discuss options with others in your organization. We can save money by making efficient use of building materials and systems and by managing the construction process carefully. Our involvement in the construction phase can save our clients significant money because we can provide an experienced watchful eye and head off a lot of problems. We have invested a lot in tracking and understanding building costs, which also facilitates these savings. We like to work closely with the people building our projects when we can and we are good at solving problems as they arise without compromising the value of our designs. Clear and complete sets of drawings and specifications are also essential in this process.